Instant Indecision is a puzzle made in 1972 by The Green Gate Company. It consists of a pedestal and four wire-frame cubes of different sizes which, when placed on the pedestal, fit concentrically inside each other. The edges of the cubes come in four colours. 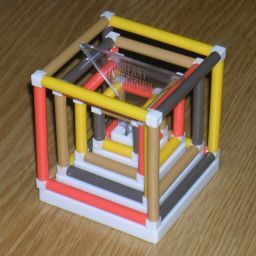 The aim is to arrange the cubes such that each row of four corresponding edges of the cubes show all four colours. The puzzle is clearly inspired by Instant Insanity. Each cube has 24 orientations, giving a maximum of 244 positions. Whichever way the first cube is placed, the solution you are aiming for can be rotated to match, so it doesn't really matter how the first cube is placed. This essentially leaves only 243 = 13,824 positions. The puzzle can be solved fairly easily by trial and error, but there is a way to reduce the search space considerably. A cube has four main diagonals. The 24 ways of orienting a cube correspond exactly to the 4! ways of permuting those four diagonals. We can split the 12 edges of a cube into four sets of three edges which are symmetrically arranged around the diagonals.